Last week I received from several friends a link to a story out of UC Davis headlined “Newborn horses give clues to autism.” The link to the article also began appearing on social media news feeds. 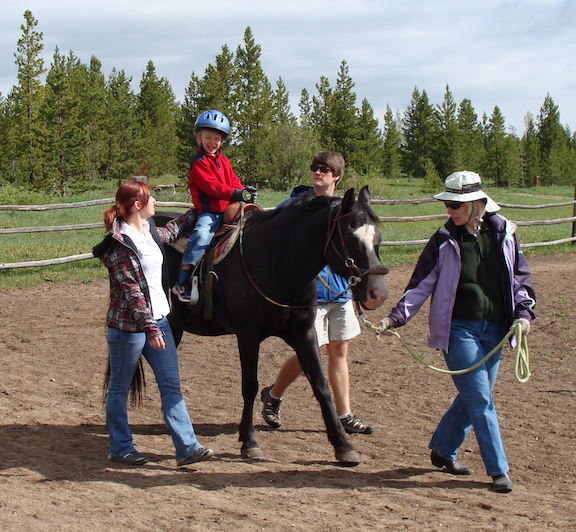 Harrison riding a short-eared equine at Adams Camp. First of all, these researchers are comparing a condition that is apparent at birth in a species that must walk within moments of being born, to an entirely different condition not apparent at birth in a completely different species in which the young do not walk until they are several months old. This seems like comparing apples and oranges . . . to peaches and mangos. In fact many people feel autism develops in humans much later than birth. Despite repeated “scientific” reassurances from the medical establishment and the government that vaccines do not cause autism, about half the population still believes they may play some role in its development. Many leading experts, including Temple Grandin, say the possible role of vaccines in autism warrants closer investigation. Personally, I believe the cause of autism to be rooted in some perfect storm combination of genetics, environmental triggers and multi-dose vaccinations. “There are thousands of potential causes for autism, but the one thing that all autistic children have in common is that they are detached,” said Isaac Pessah, a professor of molecular biosciences at the UC Davis School of Veterinary Medicine and a faculty member of the UC Davis MIND Institute. Now this really sort of annoyed me, not only because it simply isn’t true, but also because quotes like this help perpetuate a stereotype. Autism affects many different children in many different ways, and detachment is not always present. Prof. Messah should meet my son Harrison. He’s not detached. And neither are many other kids on the spectrum. Autism is so much more complicated than that. I wrote to Pat Bailey, the author of the article, and stated my concerns. I received a nice note back saying, “When Dr. Pessah used the term ‘detached,’ he did so with the full realization that it applies to a really broad spectrum, ranging from very, very slight to profound. And he certainly didn’t intend any disrespect . . .” She also mentioned that the core of this research moving forward will center on understanding neurosteroid levels in horses at birth. I was not so much offended by the quote as I was struck by the apparent lack of understanding of autism. And, while there is research showing autistic humans displaying dysregulation of neurosteroids, there’s no evidence this has anything to do with anything that occurs at the time of birth. So once again, this horse-human connection is nebulous at best. An MIT researcher recently predicted that at current rates half of all kids will be autistic by 2025. I’ve worked around equines — horses and donkeys — for 30 years and had never even heard of maladjusted foal syndrome. I appreciate researchers looking for clues to the autism epidemic but this really seems like a case of over-reaching to me. What we really need is more understanding and honesty about the real causes of autism, and also how to best help autistic people work with their behavioral challenges and reach their full human potentials. That’s where I see research into connections between animals and autistic kids to be most beneficial. Check out my new book, Full Tilt Boogie — A journey into autism, fatherhood, and an epic test of man and beast now available on amazon. This entry was posted on February 17, 2015 at 10:21 am and is filed under Uncategorized. You can follow any responses to this entry through the RSS 2.0 feed. You can leave a response, or trackback from your own site.